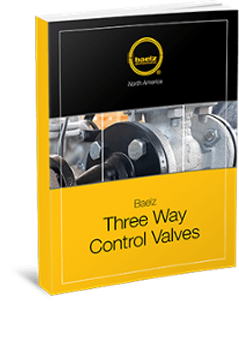 Control Valve Assemblies | Baelz N.A. As specialists in a complete array of control system components, the Baelz NA team can supply fully assembled, custom crafted control valves. With a wide range of actuator, valve, and body style combinations, we look forward to designing an assembly to fit your precise specifications. Baelz NA custom control valve assemblies are delivered ready for installation with all necessary process requirements. The control of flow rates, liquid levels, temperature, and pressure in a system are all either directly or consequentially driven by control valve assemblies. These assemblies can be built from the ground up, with complete customization to fit your project. Popular actuator choices for control valve assemblies include electrical and pneumatic power. The simplicity of operating with compressed air makes the pneumatic actuator a particularly efficient and safe choice. Control valve body types tend to fall into one of two action styles: sliding stem or rotary action. Baelz NA ball valves, 2-way ball valves, and butterfly valves form the base of some of our most requested custom assemblies. Since 1896, components from W. Baelz & Sohn GmbH & Co. have been built with a true dedication to high performance, energy savings, and competitive cost. Our team at Baelz North America works to build control valve assemblies to meet your specific process requirements while operating with every one of these values in mind. 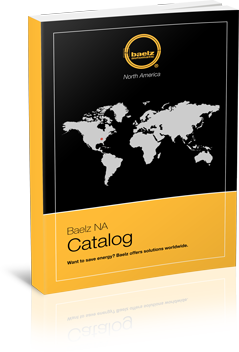 As an official distributor for Baelz Automatic parts and engineered systems, we also provide North American customers with the local benefits of personalized service and short delivery lead times. From actuators and control valve assemblies to heat exchangers, automation skid packages, and engineered systems, we stand for quality at its finest. Contact us today to learn more about how we can help with your next project.